This unique audio offering from the newly formed group Ligonier Sinfonia is a treat both historically and musically. Samples from Baroque concerto literature like Bach’s Violin and Oboe Concerto in d minor, plus a variety of instrumental works by Telemann, Handel, Vivaldi, and Couperin will delight Baroque fans. These high Baroque pieces feature recorder and harpsichord, organ and strings, flute, oboe, gamba, and harpsichord solo. Enjoy a taste of the popular music from the courts of Weimar, Paris, Venice and London. Fourteen tracks. Really beautiful and uplifting - praising the beauty and greatness of the Creator - our Lord God. Is it available in South Africa? Love listening to this CD in the calm quiet of the morning or even in the busyness of the day. It helps quiet my mind and relax. 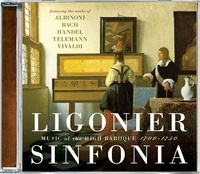 Beautiful music; highly recommend this CD.